On Friday NASA is scheduled to launch a Delta II rocket as part of the “Themis” mission. The rocket will have onboard five satellites which could have an impact for GPS users… but those satellites are not GPS satellites. What do they have to do with GPS? 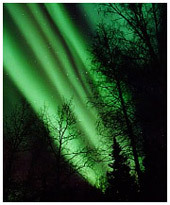 The Themis mission is designed to study the Northern Lights, also known as Auroras. If you are not lucky enough to live at a high enough latitude or have never travelled far north enough to see them you are truly missing out on one of the great wonders of our world and atmosphere. So… getting back to GPS. Auroras can cause huge disruptions in the earth’s magnetic field which can disable spacecraft, radio communication, power systems, and … you guessed it… GPS navigation. The Themis mission will study the impacts of these “solar storms” and try to understand ways we can protect our communication satellites and other atmospheric assets from these solar storms. The five satellites are expected to remain in operation for about two years and during that time they should be able to study about 30 substorms. The satellites will remain above North America and provide images and other data during the substorms. Combined with ground monitoring and photographs scientists will be able to study the storms from both ground and above at the same time.